DC AFC Grand Junction Jake "Jake" x FC AFC High Hopes Little Ann "Annie"
Allison traveled to Grand Junction, Tennessee, home of the Bird Dog Hall of Fame and the world renowned Ames plantation, to get this breeding done and we couldn't be more excited for these puppies. 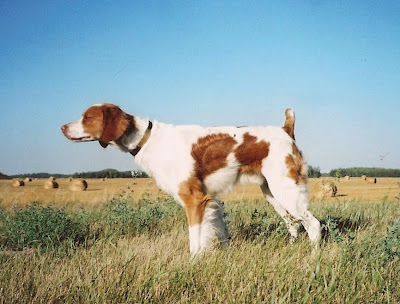 This breeding is an outcross of two excellent bird dogs with similar styles. Both are big running, hard-hitting bird dogs. Jake is an all age dog from Tennessee with a booming run and stunning point. Annie is a big running shooting dog with a snappy ground race, long nose and beautiful style. Both are excellent house dogs. We expect these pups to run big in the field but relax comfortably on the couch at the end of the day. These two dogs are great dogs in the house and in the field and we expect the pups to be fast, big running, hard hitting gun dogs. That said, both Jake and Annie are house dogs and the pups must have the opportunity to bond and live with a family. See all of Jake's Field Trial placements here. Annie is our biggest winning dog in the field and one of our favorite dogs to have in the house. In the field, Annie has a snappy run, long nose and intense point. At home, she loves attention but is also happy to curl up on the couch and take a nap. After being named the East Central Gun Dog of the Year in 2011, Annie took the spring of 2012 off to whelp her first litter of puppies, including our Luke. She returned to the field trial circuit in the Fall of 2012 and quickly qualified for Gun Dog Nationals. Annie qualified for nationals again in 2013 and was posted in the 2013 Amateur Gun Dog Nationals. We decided to retire her after that run and let her focus on being a hunting dog and mom. See all of Annie's field trial placements here. This pedigree is an outcross of two exceptional dogs with amazing pedigrees. The parents and grandparents of this litter all earned at least their FC and AFC titles and combine for 249 adult field trial placements. In addition, 5 of the 6 earned a placement in a Brittany National Championship.